BUCYRUS — In 2006, a small group of people met to discuss ways in which veterans could be honored in Crawford County. The idea for the Crawford County Veterans Hall of Fame (CCVHOF) was born. The group continues to grow its presence in the community. A wooden monument was constructed and put in place at Bucyrus City Hall in 2007 and last year, the permanent monuments were erected on the southeast corner of the lawn at the Crawford County Courthouse. Both sites feature the names of the 66 veterans that have been inducted since the first ceremony in November 2007. According to CCVHOF president Chuck Christman, there are plans to create a memorial area within the current monument site at the courthouse that will be dedicated to honoring those that have died while serving in the military are underway. 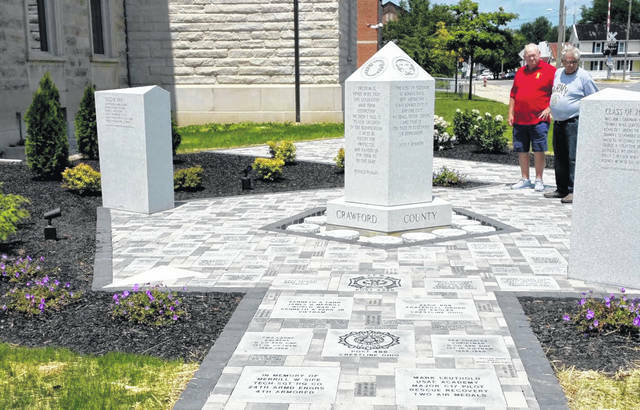 “We are taking names of Crawford County veterans who lost their lives in service, killed in action, died of wounds or disease or due to an accident,” Christman said. The new project will cost approximately $35,000. “We are asking for donations from local businesses, organizations and individuals along with the sale of engraved pavers to be placed at the monument site,” said Don Scheerer, secretary of the CCVHOF. Scheerer said the centerpiece of the monument will be put in place along the east outside wall of the courthouse at the hall of fame site this fall. “We hope to have the centerpiece in by this fall and the bronze plaque with the names engraved on it by Memorial Day,” Scheerer said. For more information, to provide names of veterans who died while serving or to order a paver, visit the hall of fame’s website or its Facebook page. Chuck Christman can be reached at 419-562-4740.